Not far from where I live is a donkey farm. It’s highly popular because of the donkeys’ beauty. Donkeys, the most mistreated of animals, have a gentleness that draws and heals people. It’s a sanctuary for the donkeys but also for the people. When the Gospels were written, no therapeutic donkey sanctuaries existed, but the donkey was a common animal of service, humble and ordinary. The donkey appears in every Gospel. All four evangelists show Jesus entering Jerusalem to a great welcome — riding, not a majestic horse that a king or warrior might ride, but a donkey. In our day it would be like a world leader, instead of coming on a private jet welcomed by military bands and ribboned officials, putt-putting in an old faithful station wagon. Like the pope rejecting fine limousines and driving a humble compact. The church gives us this glimpse of Christ at the end and beginning of a special journey together. We are ending Lent, the journey into the desert. We are beginning Holy Week and the Easter triduum. To mark the end of the Lenten journey and the beginning of this year’s Easter journey, we open our gates (like the people of ancient Jerusalem) to welcome Christ — and be surprised. It’s the perilous journey. And we are in it together. 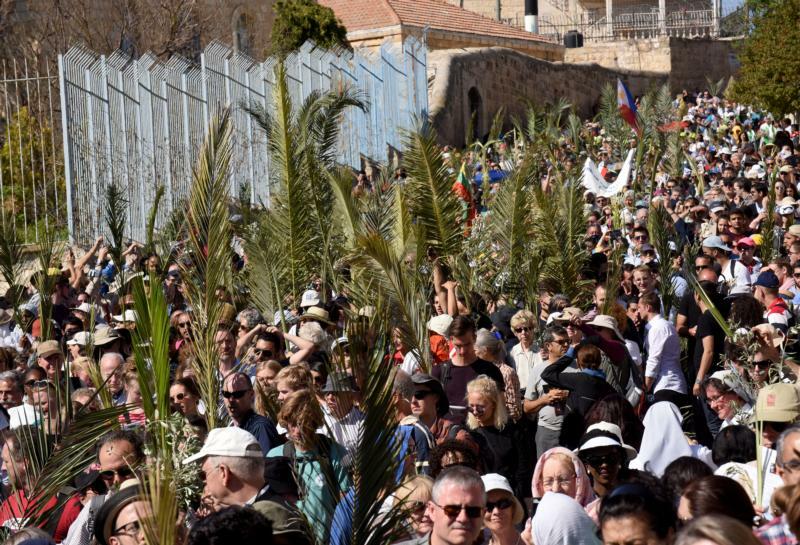 Now, at Palm Sunday, it’s time to be accounted for. It’s time to take up something. Our Lenten journey has been mainly hidden. We’ve been meditating, praying, doing works of mercy in secret, fasting in our own ways — trying, failing, trying again. Palm branches are reminiscent of victory parades. But more important, they point us to martyrdom, which means “witness.” We are asked to witness Christ, not only in inward hidden ways but also publicly with the way we live. For some, this witness is even unto death. The Coptic Christians who were beheaded in 2015 are painted holding palms in their hands, for they showed by their lives who Christ is. They met violence with love. They remind us that being Christian is not just “all about me” and making myself a better person — though it does allow and challenge me to become more God-like. Christianity is also about bettering one’s world, laying down one’s life for others, and in this way following Christ. We see today the joy of letting Christ in. He is welcomed with exultant joy and singing. How overjoyed we are to know God and to know that God loves us and will never disappear or give up on us. We can’t keep it in, so we have to go out to meet him waving green branches and singing to him. It’s so beautiful, so glorious, it bubbles to the surface and overflows for the whole city to see. We are welcoming God! More astonishing still, we are welcoming humanity. The early Gospel commentators saw the donkeys as a symbol of Christ’s humanity, as with the donkey on which the good Samaritan placed the wounded traveler. When we see Christ riding a donkey, we see God taking up humanity. Like the donkey, our humanity becomes a bearer of God. Christ enters into Jerusalem in a state of humility, because God enters the world carrying our humanity. Ultimately, then, rejection of Jesus is not only rejection of God, but also of humanity, for Christ is truly human as well as truly God. Why should we reject Jesus? Because it’s not easy to be with him. To enter Jerusalem on a donkey, as he did, is not glorious like entering on a fine horse or a jet airplane. Jesus’ donkey ride shows us that this is a journey of humility. It will make us a laughingstock. This journey will lead us through who we truly are as human beings. Along this path, we will find God even in those parts of us that are most frightened to let God in, most resistant to being changed, most inclined to cling to power and fight back. As the perilous journey ends and begins, let’s enter Holy Week together. Let’s risk accepting the joy of welcoming both God and humanity. God will not disappear on us. He gives us the capacity to love, no matter what. Let’s not be ashamed of him or of our humanness, but claim them. Let’s look for victory not in pomp and military might but by way of humility, powerlessness, love and forgiveness. Here is true joy. Here is the way to meet the early dawn of Easter Sunday. Let’s be unafraid to wave the palm. To pick up the cross. And to meet the new life that awaits. Marrocco is a theologian, writer and practicing psychotherapist. She is involved in spiritual formation of seminarians and lay pastoral workers in Toronto and founded St. Mary of Egypt Refuge, a place of hospitality and welcome for people in need. She is an ecumenist who specializes in the relationship between Eastern and Western Christianity.